Hack a Day alum [Will O’Brien] recently upgraded his phone, and was trying to find a use for his old one. He always wanted a remote starter for his Subaru Outback, but wasn’t interested in paying for an off the shelf kit. Since he had this old smartphone kicking around, he thought that it would be the perfect starting point for an SMS-triggered remote start system. He started off by jailbreaking his phone, which allows him to run some Perl scripts that are used to listen for incoming texts. Using a PodBreakout mini from Sparkfun he connected the phone to an Arduino, which is responsible for triggering the car’s ignition. Now, a simple text message containing the start command and a password can start his car from a anywhere in the world. While [Will] is quite happy with his setup he already has improvements in mind, including a way for the Arduino to send a message back to him via SMS confirming that the car has been successfully started. He’s thinking about putting together a kit for others looking to add the same functionality to their own car, so be sure to check his site periodically for project updates. Do you still have to pay the full phone/data/text package on that second phone just to do that? If so thats pretty pricy. How long until the data rate outstrips the cost of a dedicated remote start unit? That’s something to consider I think. You would need to for it. I would go with the Arduino Cellular Shield sold by Sparkfun, and use a prepaid SIM. It’s $100 + the SIM, but saves money over $60+ for cell service on the old iPhone. If the car is kept within range of his Wifi then he may not need a package at all. I could see a few improvements to this. 2. Summer Mode… roll down the windows to get rid of the hot air..
3. Winter Mode.. To kick in the heated seats (if available). 5. Remote kill. If someone steals your car, a simple text message can disable it. 6. Remote taser. If someone steals your car, you can electrocute the seat. 7. For convertibles, when the forecast is rainy, it puts the top up automatically. For me as a non-bank-robber – why would you want/need such a feature? I usually find myself wanting one when it’s the middle of winter and freezing cold outside. It would be nice to start the car a couple of minutes before I have to go sit in it! The problem is, that you have to remember to adjust the air vents and temperature, and the glass heaters etc. for the next time when you stop the car. If you don’t, then you’ll find that the temperature is set low, the fan is barely blowing and the rear window heater is off, because you turned them down the last time you were driving. We need more intelligence in the car. It should automatically adjust the heating so the engine warms up quickly, and then direct the heat to defrost the glasses and warm up the interior. Or you can just buy a gasoline heater. They usually come with timers and remotes, and they heat up the car before you have to start it. Those of us that really need a remote start for winters usually never leave the heater off defrost anyway. Even if the fan is on low it will make a huge difference, and the engine will have had time to warm up so flipping to high will work faster. I’ve solved the same problem with an electric heater and a timer that I set for half an hour starting at some time before I want to leave. The block heater heats the engine, and the blower heats the interior. Couldn’t be simpler than that. You can program your work schedule into a simple timer, so the car is always warm when you need it. No need to bother with sending text messages. LOL for a criminal a remote start would be worthless. Even if the engine is running they still need to put a key in the ignition lock to make their getaway. No, all they have to do is reach down where the brake switch is by the pedal and clip the wires. No brake lights anymore, but no brake switch to disable the remote start. You cannot put the car in gear if there is no key in the ignition, most people would also have their car doors locked while it’s running, also, you wouldn’t be able to steer if the steering column is locked… So no, it’s not as simple as cutting some wires. There is absolutely no way anyone would be able to steal the car without performing the usual car theft methods. My car requires a fair bit of disassembly to get to the brake light switch, and even then pretty much requires a headstand in order to get a hand up in there to do anything with it. It’s not easily groped. But it doesn’t matter because modern cars with automatic transmissions generally require one to press the brake pedal in order to shift out of park. On my BMW, this is done electronically. Now, sure: You can tear into the gearshift assembly to open/ground/short/apply voltage to whatever wires need goofed with, and it’s easy enough to get to, but it will require some model-specific knowledge. The E36 BMW has no mechanical linkage between the gearshift and the transmission, so it’s not like one can just start cutting/shorting wires randomly and have any great chance at, well, anything. I’d be very surprised if most other more recent cars, with their much fancier transmissions, are not similar. And then there’s the steering lock, which is strictly mechanical and operated by a key. Easy to get to, but had to break. Oh. And I almost forgot: There’s a “feature” on my BMW whereby if you attempt to destructively access the brake light switch, the constant 12V line for the chime module gets torn up by the sharp metal knee guard just under the steering column. This blows the “Clock” fuse, which entertainingly causes the car to not function at all even -with- a key. So then you’re under the hood checking fuses, too. And by this point, it becomes clear that stealing the car that “was just sitting there running” but has no keys is a worse idea than just taking the one next to it that isn’t running on a remote starter. The prospect of someone successfully pulling this off is an interesting thought, though: I should modify my remote starter to automatically double-lock the doors and roll up the windows whenever the start sequence is aborted (by pressing the brake pedal, exceeding the timeout, or whatever), so that the not-so-clever thief will have to break a window to get out. I have a spare iPhone leftover from my switch to Android, and due to a text message left on it from a family member am never trashing it… I might as well put it to use. If it is jailbroken you might as well unlock it, and then use another SIM or something. IIRC AT&T still has some pre-paid SIMs (maybe not anymore, but another provider on GSM should work with an unlock). Only thing I would change is that I would add two-factor authentication, due to the fact that texts can be recovered and if someone stole your phone they have access to your car. I would do this by either A) using a google account I don’t care about and have the two-factor TI Chronos watch authenticate against that, or B) make my own system that runs on the phone. I may do this, if I do I’ll be sure to send it in! it requires an authorized phone number as the sms source. Wow, remote car starters are so cheap, why would you waste your money and time on this? You can get a remote start with a whole range of features including remote paging and very long distance starting for under $100. Unless your time is worthless and your phone plan is free, this is a huge waste of time. Even if your time is useless and your phone plan IS free, this is still a horribly poor implementation of a remote starter. Tact that anyone could start your car if they knew the # and proper command makes this rather useless and potentially not safe. Hacking is about modding existing things to accommodate our own needs. If you buy an off the shelf product, it’s not personalized. By making his own, he is showing his ingenuity and is getting a better product than anything you can buy, because he made it and is personalized. If you read the code, you’ll find that message sources are limited to authorized phone numbers. In addition, the command requires a password to initiate. It actually works great and I get a reply telling me that it was activated. If someone mucks with it, I’ll know about it. I was under the impression that the phone number of the sender can trivially be spoofed. Obviously, it’s another level of obfuscation, but it seems pretty vulnerable anyways. aftermarket remote start on cars with transponder keys means there is a key kept inside. Except on some ford and GMC makes where the algo was cracked..
Good installers snip the mechanical bits of the extra key off, leaving just the plastic end with the RFID magic. Another option are bypass interfaces: these either contain a relay + rfid chip or a microcontroller. The relay / rfid units are programmed into the car’s list of valid keys using the dealer / factory programming method. (often requires two already programmed keys to start). The microcontroller units tie into the can bus or other proprietary data wiring coming from the rfid sensor package on the key slot. They inject the “all is well, key is present” signal back to the ECU. Both of these generally take a signal (ground an input wire) from the remote start to trigger them to fake out the car, a knowledgeable thief could manually activate these to allow starting of the car whenever they wanted, assuming they can get at wherever they are installed. Some of the micro-controller based units can talk to the micro-controller in the remote start module itself via a serial connection instead. Some that offer this feature when configured in this manner set an e-fuse to disable the simple non data driven activation wire, making the bypass module useless unless activated by a compatible remote start brain. I had a 1998 Chrysler Sebring convertible. It had the RFID keys and I had a plain key made. I tried holding one of the RFID keys next to the steering column and starting it with the plain key. It wouldn’t start. Tachometer check: You don’t want the starter engaged too long or activated if the car is already running. Also, you may want it to retry the start sequence if it didn’t succeed on the first try. One doesn’t need a tachometer, really. Watching battery voltage is generally adequate, and can be almost a pure-software hack. It goes like this: Engage starter, voltage drops due to the heavy load on battery, crank crank crank, engine starts, starter goes from heavily loaded to being driven by the flywheel (it becomes a generator), voltage drop ceases (at worst), alternator spins, voltage goes up. By now, she’s obviously running — disengage starter. After that, just watch for voltage on the ignition switch. If it’s physically turned on (“high”), simply refuse to do a remote start. Or (better), use it as an opportunity to electronically switch the ignition to “on,” and keep it that way until something else cancels the routine (brake pedal, timeout, etc). This lets one keep the car running, with wipers and defrost but without a key in the ignition and with the doors locked, while making a quick shopping run, picking the kids up, or whatever. It’s surprisingly handy on the coldest, nastiest winter nights: Freezing rain doesn’t have a chance. It is also useful on short trips (even in the summer), which are otherwise be murderous to an engine that might never get a chance to warm up properly during a run cycle. My 07 silverado has remote start. It automatically adjusts the temp controls based on the temp inside the car (AC when hot and heat when cold). I was just thinking the other day that it would be nice to do a remote start via sms since the range of my key fob is about 100 yards. Not very useful when I’m at work and the truck is parked so far away. Or mod the receiver. It’s the same game, but it’s far easier to haul around a bigger antenna fixed to a Silverado than it is to carry a bigger antenna on one’s keychain. I see so many people finish projects similar to ones I start. Never ceases to amaze me. I was planning on using an old nokia for door unlocking. While the original article doesn’t explicitly mention the type of trasnmission the main drawback that comes to mind involves those of us who drive manual cars. We all leave the car in gear when we get out, just in case the handbrake fails. Also I’m assuming the phone validates whether or not the message comes from you. early version of iPhone becomes history and “old one” ? Not any different than how the first ford automobile is now history and “old one”, is it? 100 or so years later the world still turns. Don’t think of it as an iPhone, think of it as a processor in a case with battery, loads of sensors (camera, light, tilt, accelerometers, magnetic, GPS) and communication options. Some of the failed Android tablets at the local discount clearance outlet are just begging to be re-purposed with a good hack. One of the rather good Android tablets which Staples sold several tons of, the Nobis NB7850 S, is waiting for someone to hack anything on it. No root exploit has been done. No official system updates. Just a nice, aluminum cased, 1024×768 KitKat tablet yearning for a Lollipop upgrade. @Dax Don’t know where you live, but in many places it doesn’t take that long for the engine to cool down when parked for a few how hours. The block heater & electric heater work well when parked over night at home, others can’t do the job. As another mentioned in Winter the controls are rarely move from defrost or heat to off, otherwise it becomes second nature to put the controls where they would be need when parking the car for over night. I was thinking of aftermarket until I ran into their services, you must pay a fee monthly for updates to their systems which in the end is like a phone data plan in it self. Like this ‘Phone Hack’ You can expand given the device already has potential to GPS Track your Vehicle or know if it has been started already giving you the instant access of knowing when someone has touched your prized possession. The remote start is just a bonus I think. @STrRedWolf: If you read my site, you’ll find that I’m using a T-mobile pay as you go. $.10 per message, but for $15/mo unlimited texts. No expensive iPhone data plan. @fubar: the remote starter I used, (avatar) implements the timer already. The iPhone is simply a remote trigger system. As for two factor auth: already there. you have to use an authorized phone number as the sms source, plus the password. Not a serious 2 factor, but it’ll generally limit unauthorized users. I don’t know which iPhone it is but It got me wondering if you couldn’t add some some other functions like GPS tracking. Or having it send the GPS location to your current smart phone when ever you turn off the car “For a car finder app”. or even using it as a music player as well. I got a bulldog unit at autozone for $85, a few wires under the dash and it controls the ignition, locks and trunk. And it was cheaper than buying replacement remotes on a 2000 maxima. I don’t think I can remote-start my harley, maybe another project – but I have a few Motorola C168i phones I got from newegg closeout – the ones with TTL serial via the headphone jack. 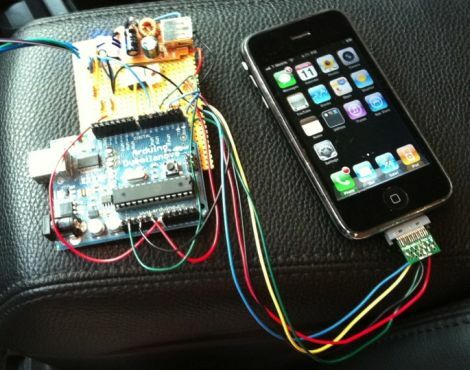 I should try something with SMS – I have j1850 and gps via arduino and others and a BT OBD2 adapter on my subaru. Cool idea, next is a sms status readout of the fuel level, rpm, etc. and turn on the heater/ac, etc.